and durability. 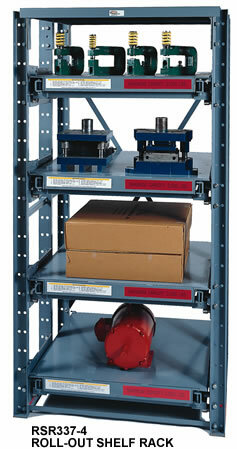 Shelves of 10 ga. steel roll out one at a time and lock in the extended position for maximum safety. 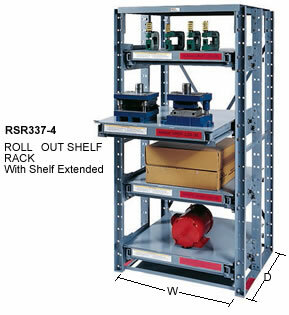 The Roll-Out Shelf Rack is available in three heights and three shelf sizes. expanded to meet everchanging storage requirements with add-on units. Ships knocked down for freight savings; gray enamel finish. units, shipped ready for use. Contact us for assembled pricing. SHELF WIDTH FIGURE FOR OVERALL WIDTH DIMENSIONS. Industrial Racking and Shelving, Steel Storage Racks, and Warehouse Storage Racks from your source for material handling equipment.